A protocol for pectin monomer analysis is reported. It consists of hydrolysis, derivatization with 1-phenyl-3-methyl-5-pyrazolone (PMP) followed by UHPLC-analysis. A combination of enzymatic and acidic hydrolysis improved the yield of released aldoses. The tagging reaction should run for at least 1 h at 80 °C, thus longer than previously reported. Products were analysed by the use of a resistant C18-column and a gradient of acetonitrile in a volatile buffer (20 mM NH4HCO3/NH3, pH 9.2). Chromatograms revealed baseline separation of two pentoses, two deoxy-hexoses, three hexoses and two uronic acids within a 15 min run. Quantification was based on absorbance at 250 nm, whereas peak identities were confirmed by use of ESI–MS. The protocol was applied to pericarp fractions of tomato pectin, and the results were compared to those obtained from an established method based on GC-analysis. 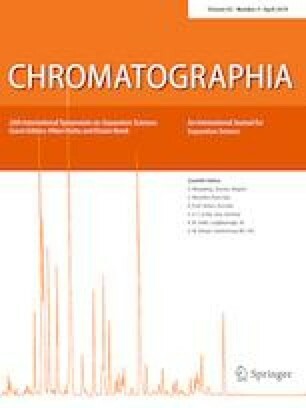 The new method had the advantage of being more rapid and produced simpler chromatograms. This study is part of the research project ‘Biofresh’ which is funded by the Research Council of Norway (project no 255613/E50).